According to some sources, Duane used this amp in the Hour Glass era (1967/1968). However, there doesn’t seem to be any photos of him actually using the amp, and as we’ll discuss a few paragraphs below, it seems that even though the band traveled with several of these amps, Duane himself preferred not to use it. 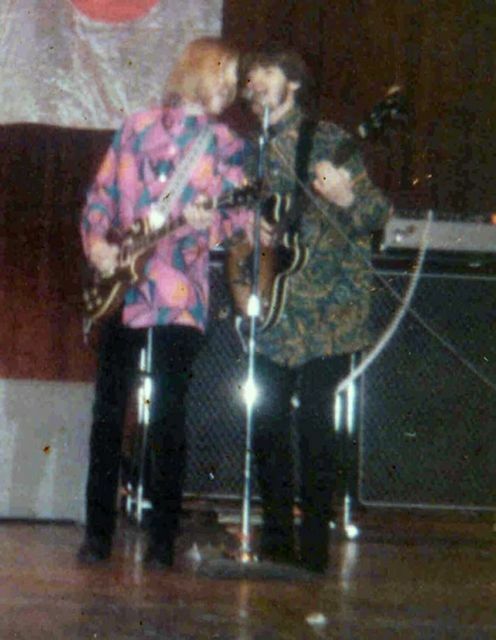 What could’ve also potentially started this whole rumor of Duane using a Vox Super Beatle is a photo of Duane and Bob Keller (band’s bassist at the time) singing through a microphone together on stage, dating sometime to 1967 [Hour Glass – Duane and Keller]. On the photo, Keller’s amp can clearly be seen as a Fender Bassman Blackface, but unfortunately, Duane’s amp is hidden right behind him. We do, however, see that the amp is plugged into a Vox cabinet, identical to what a Vox Super Beatle would come with from the factory. What is most likely the correct version of the story comes from late Larry Steele, a Jacksonville local who later served as stage manager and as co-writer for the band .38 Special. Larry recalled in an article on his website meeting The Hour Glass at the Comic Book Club on July 12, 1968., as they were loading out the gear and setting up the stage. A guitar player himself, Steele vividly remembers seeing a few Vox Super Beatles but also finding out that Duane didn’t use any of them. Just a note – in case Larry Steele’s website is offline (as it happened to be at the time of writing this), you can access it by using Google’s Web Cache. Also, Larry published a book in 2016 (Steele, Larry (2016). As I Recall: Jacksonville’s Place in American Rock History. ISBN 1530443024) in which he goes into more details about some of this stuff.